As the QTU Officer with carriage of part-time issues, I am only too aware of negative perceptions within some schools regarding part-time teachers. Examples include workplaces claiming they are “not a part-time school”, that the “quota” for part-time teachers is full, mandating explicit fractions only, and that experienced teachers must undertake roles not matching their skill set in order to “quarantine” the part-time arrangement. Often the concern that “parents don’t like part-time teachers” can be an influencer. There is a clear disconnect between departmental policy, which on the whole is very supportive and reasonable, and the information provided to decision makers at a school and regional level. 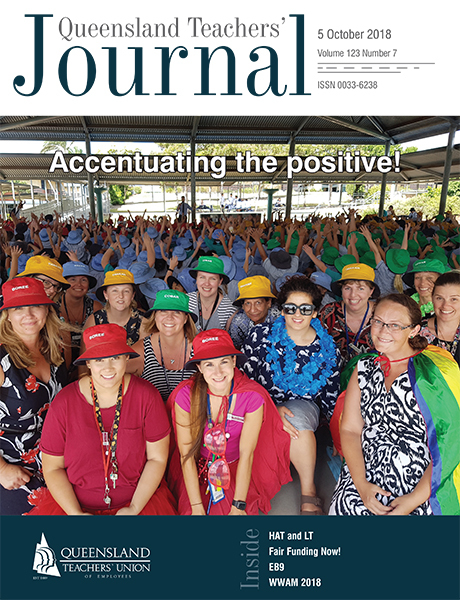 It is not appropriate for schools to develop their own part-time policies - all departmental employees are employed by the Queensland Government and are employed under public service conditions. IPS status has NO bearing on these employment conditions and entitlements. The QTU has been horrified to hear of highly skilled high school maths and science teachers extending their leave in regional settings to work in local convenience stores, as they were told they could not access part-time. We have seen women resigning from the department and losing accrued entitlements, along with their job security, after they were told (incorrectly) that they could not access part-time. We were told of highly skilled teachers being given part-time roles, such as internal relief, that undervalued their skill set, thus de-skilling them. We are also only too aware of the perception (and often, ill-informed advice) that classified officers cannot access part-time, regardless of their circumstances. A recent trend sees pressure being placed on part-time teachers to work half-days. Half-days should only be timetabled in exceptional circumstances, or where the teacher themselves are seeking this option because of their circumstances. The practice of having set part-time fractions is also not appropriate. It is important that teachers apply for the employment fraction that suits their individual needs and that they negotiate with the school. Compounding recent negative experiences has been the release of the department’s new policy and procedures, particularly the initial application form, which contained timeframes that were inconsistent with the Queensland Industrial Relations Act (2016). This is being amended. The department is now managing parents returning from parental leave under “part-time” and employees seeking to work part-time for other reasons (health, care responsibilities, transitioning to retirement etc) as “flexible work options”. However, at the time of going to print, the flexible work options procedures were not yet published on the Education Policy and Procedures Register (EPPR). Currently, teachers working part-time are moving up the salary scales slower than their full-time colleagues (and thus taking far longer to reach senior teacher and experienced senior teacher). Not only do they take home less pay, they accrue fewer entitlements (LSL, sick leave etc) and their superannuation is also impacted, often at a time that will have a significant impact, given the compounding nature of superannuation. The department supports part-time and flexible work options. Anyone can apply for part-time (including promotional positions). Unless requested, half-days are no-go, especially for parents of young children. All applications must be considered on their individual merits, there are to be no quotas or set part-time fractions. Any application not approved must be responded to with a written reason as to why it cannot be accommodated. Parents returning from parental leave are entitled to work part-time and should make their request seven weeks prior to returning (not two clear terms as was mistakenly published). Substantive full-time employees have the capacity to return to their full-time role in the event they inform their school (in writing) within the transfer timeframes for the following year (without making an EOI or application for transfer). Decision makers unsure should seek experienced HR support.